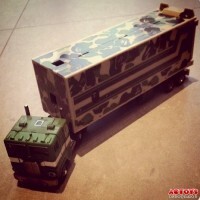 In-hand images of the recently revealed G1 Optimus Prime (Convoy) BAPE repaint have already found their way onto the Chinese toy site ACToys. Take a look at all the camo goodness below. Those pictures are pretty terrible for showing off the figure. Realizing this, My want for this is unshaken. Though really, if you want to be one of the first to show something off, turn on some lights or something. I'd like to see better pics pop up soonish. I'm getting solar panels put on the roof in a few weeks! Sabrblade wrote: This thing is giving flashbacks to this conversation. This Optimus is naturally green instead of naturally red, just like I was trying to get at. If it was anyone other than you, I would be totally floored by the fact that you remembered that one conversation from way back in September. I'm just bummed that I missed out on that thread back then. Since my prior occupation for nearly 15 years had me dealing with color on a daily basis I would have loved to have put my 2 cents worth in. As for Camo Prime, I like it. I wasn't so thrilled with it when I was just seeing the cab but once you see the truck & trailer together it makes a lot more sense and looks good...mostly. I like the fact that they at least made an attempt at camouflaging the trailer but I can't say as I'm fond of the pattern. Something closer to woodland as opposed to marshland would be more befitting a truck of that size. Of course having the digitized pattern of camo would have been even better. That's just me nitpicking though. They did good and I wouldn't pass this up no matter what the pattern. Well, I don't see anything preventing you from doing so. So, feel free to jump into that thread anytime. 4,820 pages were recently viewed by 599 unique visitors. This page was viewed 1 times on Monday, April 22nd 2019 11:33pm CDT. © 2019 Seibertron, Inc. DBA Seibertron.com. All Rights Reserved. Established June 2000. Seibertron.com is owned by Ryan Yzquierdo.